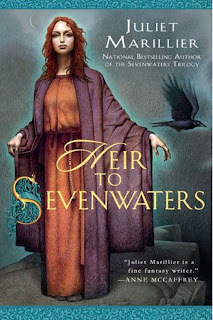 At last the covers of the upcoming Heir to Sevenwaters by Juliet Marillier and Fortune and Fate by Sharon Shinn. Both are sequels (of sorts) to Marillier's Sevenwaters Trilogy and Shinn's Novels of the Twelve Houses respectively. Heir to Sevenwaters follows Liadan's niece Clodagh and takes place about 3 years after the events of Child of the Prophecy come to a close. Fortune and Fate follows the Rider Wen who leaves the royal city and the Riders behind at the end of Reader and Raelynx. The best part, you ask? They come out the Same Day. So mark November 4th on your calendars and start trying to decide which one you're gonna read first. I was beside myself with excitement when I found out her next one was going to be a Sevenwaters book. 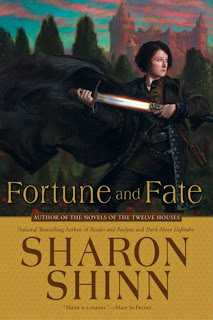 I'm so looking forward to the Sharon Shinn book! The cover doesn't look as pretty as the previous ones in her Twelve Houses series, but it's an interesting scene. And I need to read Marillier. I'm embarassed to admit that I've one of her books sitting in my TBR pile for ages! It does have a different style, doesn't it? I wonder what made them decide to make some changes. I highly recommend the Marillier. Start with Daughter of the Forest. It's just beautiful. oh my gosh, like the best day ever!! Everytime Marillier comes out with a new one, it's a special occasion. As for Sharon Shinn, I loved her Samaria series, but nothing else she wrote ever really clicked for me. Hi, Em! The Samaria series holds a special place in my heart as well because they were the first Shinn books I read. Do you have a favorite among them?